Jason is going to be on SNL!!. 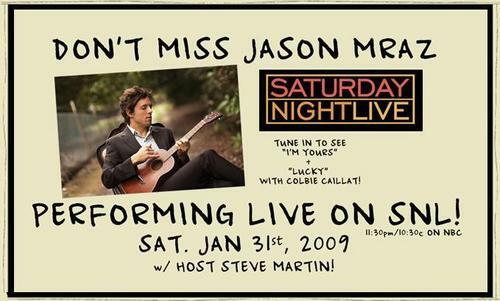 Don't miss Jason on SNL on January 31st! (Steve Martin too!). Wallpaper and background images in the Jason Mraz club tagged: jason mraz steve martin snl saturday night live january 31 performance i'm yours lucky colbie caillat. This Jason Mraz fan art might contain मोबाइल फोनों के लिए, हास्य पुस्तक, मंगा, कार्टून, एनीमे, कॉमिक बुक, and manga.